George began his work in the Chicago public schools in September 1969 as a substitute teacher. He taught at Crispus Attucks, DuSable and Forestville Upper Grade Center until 1971. He had a three-year break in service to focus on his work with the GI movement, organizing with soldiers against the Vietnam War, and study military law at DePaul Law School. He returned to teaching in 1974 as a day-to-day substitute teacher at Grant elementary then Prosser Vocational High School. For many years, he taught high school students English, while he was a day-to-day substitute teacher or a full-time basis substitute because the Board wasn’t offering its local English certification in those years. George Schmidt with some of his students at Manley High School, 2935 W Polk St., in 1980. Photo by Chicago Journal. 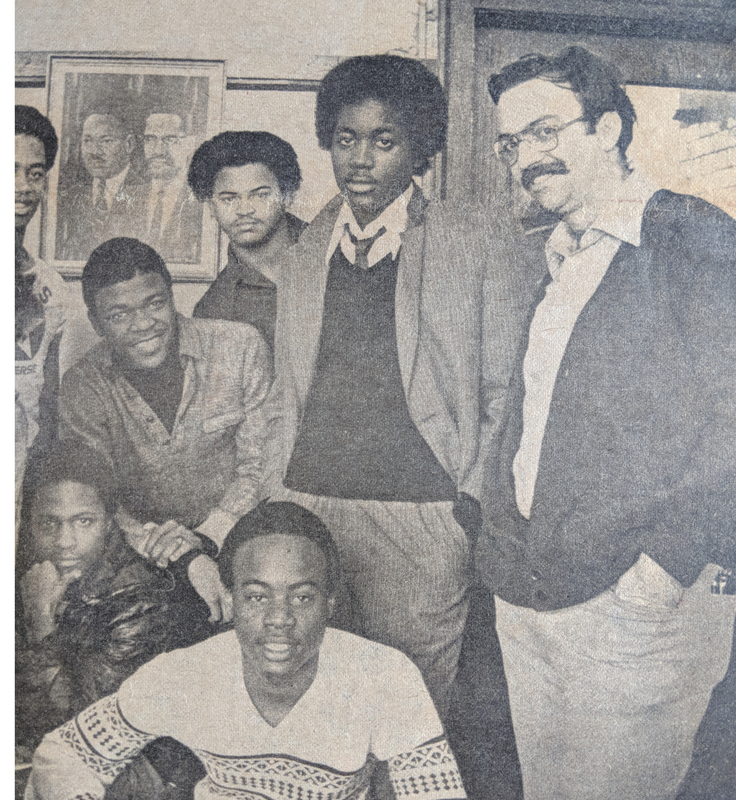 Between 1976 and 1983, George taught students at Steinmetz, Collins, the Industrial Skill Center, Tilden, Manley, Marshall, DuSable, Gage Park and Kenwood. The Board repeatedly transferred George after one or two semesters in a school in those years. George was finally assigned to an English position at Amundsen High School in January 1984, where he taught until September 1993. He then taught at Bowen until 1999. When he was at Tilden, Amundsen and Bowen he was elected delegate of the Chicago Teachers Union House of Delegates. He worked within the union in many other ways, too, as a committee chair, strike captain, AFT convention delegate. George ran for president of the Chicago Teachers Union three times. His first major activities in the CTU had to do with organizing substitute teachers in 1975, which also gave rise to the organizations SUBS (Substaitutes United for Better Schools) and then Substance newspaper. George Schmidt with some of his students at Amundsen High School, 5110 N Damen Ave., in the early 1980s.Once George was able to remain in an English classroom for any length of time, students received his brilliant instruction. At Amundsen George taught every level of English and sponsored many extracurricular activities such as the school newspaper The Amundsen Log and other writing clubs. After pioneering the use of Macintosh computers in the classroom, he was featured in the early 1980’s Macintosh Writing Resource Guide. 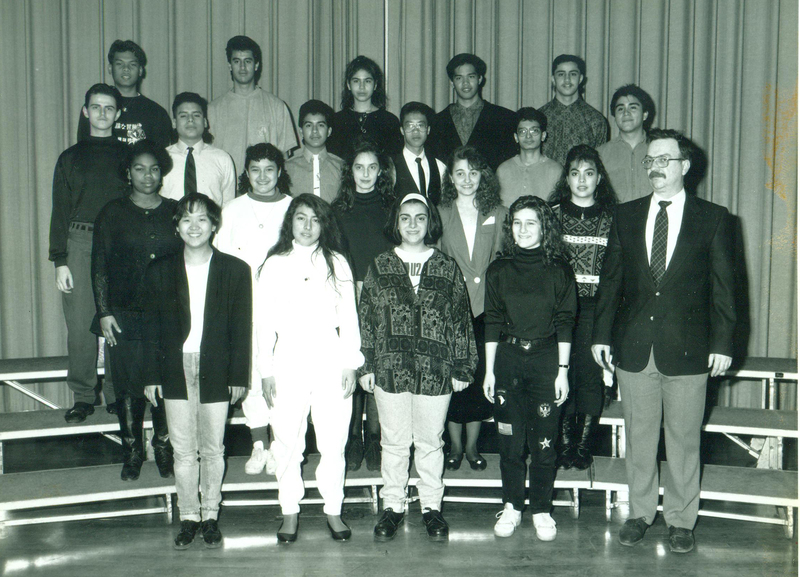 While he was a teacher at Amundsen, George was a finalist in the first Golden Apple Awards in 1986. George also served on the first Local School Council at Amundsen after the state law of LSCs was created. After being pushed out of Amundsen by then-principal Ed Klunk, for which George won a lawsuit against the Board, George was assigned to Bowen in October 1993 and taught there until Feb. 2, 1999, when the Board suspended him from teaching due to our publication of the Chicago Academic Standard Exams (CASE) in Substance. His position was officially terminated in September, 2000. The Board had sued Substance for $1.4 million dollars (damages which they did not win) for "copyright infringement." They fired George for violating board policy. The termination hearing officer said George's teaching ability was never in question. "We need more teachers like George Schmidt," he said. 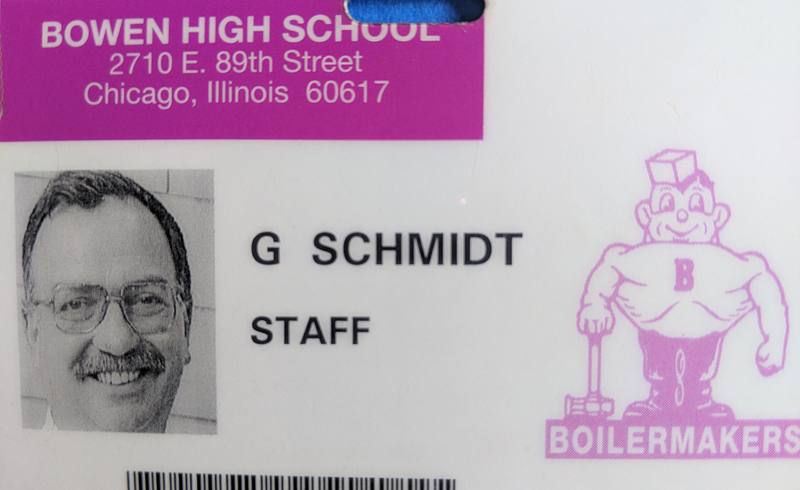 At Bowen High School and in his staff position for the Chicago Teachers Union under Debbie Lynch’s leadership, George worked for safety of students. At Bowen, in addition to teaching English, he was security coordinator, working against the violence of seven active gangs in the school. George taught at Bowen from October 1993 until Feb. 2, 1999.George obtained employment in the Chicago Teachers Union under the leadership of President Deborah Lynch and later with President Karen Lewis. He worked for the CTU in positions as researcher, director of school safety and consultant. He also worked for SEIU Local 73 as the director of research. He had loved teaching and considered himself, like Shakespeare's MacDuff, to have been "untimely ripped." George continued to edit Substance, publishing articles on the Substance website by our Chicago and national reporters, until he got sick in July 2018. A legend. A book needs to be written.